The best thing about sharing samples with other perfumistas is that every now and then you will receive one that stops you dead in your tracks and makes you call out to the heavens. I like to call this moment the ‘Eau My God’ moment – that moment where you are literally blown away by the smell wafting out of the sample vial. My most recent, and probably my strongest ‘Eau My God’ moment happened only last week. Following my Guide to Lavender, the lovely of Tara from Olfactoria’s Travels insisted that she send me a sample of Eau Noire because she thought it might be something I would like. Well, I think we can safely say that Tara knows her stuff because I absolutely love Eau Noire, so much in fact that my love for it is currently bordering on full-blown obsession. Eau Noire was released in 2004 (I’m late to the party as always) and started out as part of a trio of exclusive Dior Homme colognes, it was created by the über-talented Francis Kurkdjian (one of my favourite perfumers no less) and now sits within Dior’s ‘La Collection Privée’. Dior describe Eau Noire as “an elegant gala spirit in an intense evening fragrance” , and if any fragrance screams ‘evening’ it’s Eau Noire. This dark, brooding beauty wears a coat of emerald green and bewitches you with a sense of intrigue, mystery and danger. The first blast of Eau Noire is somewhat of a baptism of fire, there seems to be a heck of a lot going on; lavender, liquorice, curry and vanilla all whirl round you in a swirling whirlwind of scented goodness. I find it to be a totally joyful experience, and unlike anything else that has come into contact with my nostrils. Possibly the most striking aspect of Eau Noire is the HUGE amount of imortelle within the heart. It’s kind of like the elephant in the room, you can’t help but notice it, but whether you wish to talk about it depends entirely on how you feel. Personally I love imortelle, it is perhaps one of the most complex and pleasing smells around, it smells like sweet maple syrup, burned sugar and curry. Much to my pleasure, Eau Noire seems to showcase each and every one of the imortelle flower’s wonderful facets in perfect proportion. The maple and curry spices of the imortelle are a perfect fit with the lavender and liquorice, and whilst its main components are all rather weighty materials Eau Noire never feels heavy, intrusive or overbearing, it’s actually very chic in a masculine kind of way (it is of course suitable for the ladies too). Eau Noire has a very french attitude, it knows that it won’t be to everybody’s taste, but it doesn’t care, it thinks it smells great and that’s all that matters. Finally, after many hours of wowing the senses, Eau Noire settles on a base of warm spices and a wonderfully creamy vanilla. I keep trying to think whether I have smelled a fragrance as damn good as this recently, and I really don’t think I have! Eau Noire is everything that a good fragrance should be; distinct, unusual, well proportioned and exceptionally blended, beautiful and of obscenely high quality. Bravo Dior! 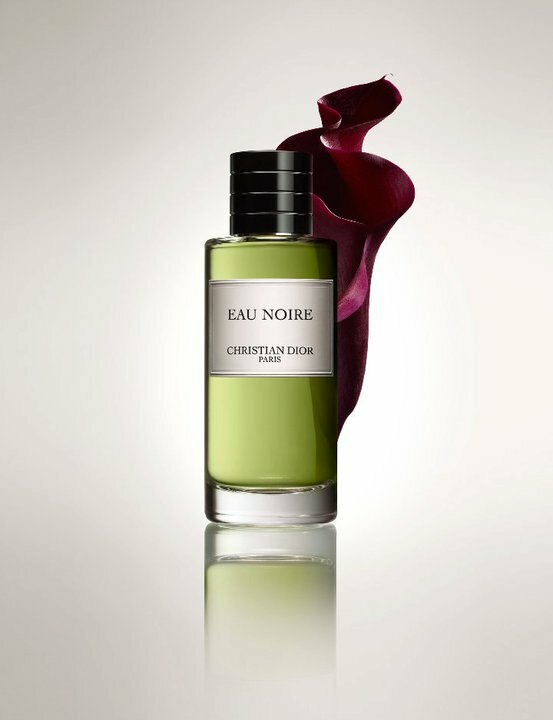 Eau Noire is part of La Collection Privée Christian Dior and is available in 450ml, 250ml and 125ml Eau de Parfum. Prices start at £120. This review is based on a sample of Eau Noire generously provided by Tara of Olfactoria’s Travels. Posted in Christian Dior, Floral, Gourmand, Unisex and tagged Christian Dior, Eau Noire, Floral Gourmand, Imortelle, La Collection Privée, Lavender, Liquorice. Bookmark the permalink. You write so beautifully, what an alluring review. And I agree with you, I think Kurkdjian has made some of the loveliest perfumes around (I really love APOM for women, Narciso and ADP’s Iris Nobile, which I believe he helped create). Tara has an astounding ability to match people with perfumes, she is responsible for some very expensive items on my wishlist. I’m glad you have been touched by the Tara-magic as well. But maybe I’ll give Eau Noire another shot sometime, you can be very convincing, you know? Eau Noire is the most intense imortelle I have tried and I can totally see how you get only curry. How did you take to the imortelle in Like This? I find it MUCH softer. As for A Taste of Heaven, I think Eau Noire has replaced it as my ‘dark, brooding lavender’, is that sacrilege? I like Like This a lot, and usually I like immortelle as a note, but not this much of it. Aha! That’s a fair point! I’m afraid I’m with B’ on this one. ~ It too was “only curry” on me, and little else. Tho’ I too don’t usually have a problem with Immortelle. (Plus I had a similar problem with Fougere Bengale come to think of it). Although reading your glowing review has just made me wish to revisit it. Maybe in this icy weather I might think differently of it (??). Gonna have to dig out that sample methinks …..
Definitely revisit it, I’d be interested to hear your thoughts! This review makes me very happy. I just knew you and Eau Noire were a match made in heaven! What a great review. Totally echo how dramatic this perfume is and of such great quality. FK has done a masterful job of blending lavender and immortelle. It is very French. Chic, daring and wonderfully unapologetic. “Wonderfully unapologetic” – sums it up perfectly! Wow…such a great description. It’s hard to comprehend how the various elements work together, but I’ll take your word for it. I need to check this out…are the stores open at 6am? Haha – stay calm please! I agree, it sounds like too much, but it absolutely works. I love, love, love it! Don’t worry, you can never be too pushy when it comes to perfume. I shall add Anima Dulcis to my list of things to try, thank you for the recommendation. I am so glad you and Eau Noire got together so well. It is a truly unique fragrance. Maybe it is also time for you to (re? )visit Sables, the iconic immortelle. Fougere Bengale is a lavender and (most people would say) immortelle combo. I do not think it really has immortelle in it. And the most beautifully balanced immortelle note in a a fragrance is L‘ Être Aimé Homme by Yann Vasnier. Hmmm…I can’t remember whether I’ve tried Sables or not, I’ll put it on the list anyways. Fougere Bengale is definitely on my list, especially after yours and Dee’s reviews! Oooh, you have piqued my curiosity now!!! I love Eau Noire more and more since I first experienced it, and your enthusiasm only stokes my fire. When I first reviewed it, I gave it “positive but middling” ratings, but as time has gone by, I’ve found less and less ‘middling’ about it. As a friend of mine always says about things she likes, Eau Noire is “gorgemous”…. and it’s definitely on my “redux” list of frags I need to re-review. Tara really should be working for Dior shouldn’t she?! The amount of people that now love Eau Noire because of her! I did think that this would be as far removed from your tastes as possible! Where can i find this parfume? It can be found in high-end department stores such as Selfridge’s and Harrods or in Dior boutiques. I never knew of this collection’ existence until very recently (I’m much later than you), because it is only available in only few selected stores where I live (Thailand). I tried each scent yesterday and bought bois d’argent, but I was also very impressed by this one, but thought 2 bottles may be too much to spend (it is priced at 12800THB, about £235 here for 250ml bottle, no other sizes). But after reading your fantastic review I need to have it lol (thanks). I will go back there to buy it today. I totally agree it’s a damn good fragrance! Gosh that is pricey! I’m glad you like the line, there’s some great scents in there. I feel the exact same way as you do about this perfume and you write about my experience perfectly. I am not used to that in a writer! Thanks for identifying the notes so eloquently.